You’ve packed extra hand-warmers. You have a new vacuum insulated mug. Your favorite boots are ready. So, you think you’re prepared for an adventure into Wisconsin’s winter wonderland … except for one thing: getting there and back. Before you travel to the great outdoors this winter, consider how a few vehicle features can add to your enjoyment and even impact your hunting and fishing success. Sometimes the smallest features can make a biggest difference. Yet, it seems like every month a new vehicle advancement in convenience or safety becomes available. Some are quite pricey, too. So, before you shop for a new or used car with just the right features to help you enjoy a great winter adventure, review our top 6 vehicle features you may want in your next used car, truck, or SUV. Assuming you know the routes you’ll be taking, and if these roads are paved or not, you can choose to buy a vehicle with either all-wheel drive or 4-wheel drive. All-wheel drive cars, trucks, and SUVs generally perform well in slippery weather conditions. And, you don’t need to activate them; they simply distribute power to wheels as necessary. Four-wheel drive systems, most common in pickup trucks and SUVs, are excellent for driving in very deep snow and for off-roading. Once 4-wheel drive is activated, its low range allows the vehicle to drive up steep hills, over boulders, and through mud. If your route includes roads that aren’t plowed regularly, 4-wheel drive is a must. A quick reminder: your drive system does not determine how well your vehicle will stop in slippery conditions. Traction is provided by your tires, and only a playing card-sized area is touching the road at any time. So, make sure you have winter tires in good condition. Their soft rubber compound grips better in cold weather. Look for the three-peak mountain and snowflake symbol molded into the tire’s sidewall. Being able to operate your vehicle safely is crucial, especially when you’re exploring unfamiliar territory. The key to safe operation is no surprise; it’s being able to see: in front of you, behind you, and next to you. You may think that heated side mirrors would cool off too quickly during travel to do much good. But, the housing unit protects against wind and cold. Overall, they’re as effective as rear window defrosters/defoggers, allowing you to remove ice build-up without having to scrape, which can shift your side mirror’s sightlines. Plus, they evaporate fog in an instant, making your early morning adventures dry, clear, and safe. Speaking of heated components, consider heated seats. Not only do they raise your body temperature when you need it most, they feel great on a sore back during the drive home from a long outdoor expedition. Oh, and a heated steering wheel can feel incredible, too. Winter mornings can be brutally cold. Especially if your vehicle is exposed to the elements when parked. You can defrost your windows and warm up your vehicle from your home or the cabin, far before you venture out. Plus, after your outdoor fun, get things warmed up before you’ve left the woods. Also, consider keyless entry, which comes in handy when you have a frozen armload of gear and food. Just walk up to the door and touch the sensor on the door instead of dropping your keys into the snow. Plus, many cars, trucks, and SUVs with keyless entry have pushbutton starting, so no more fishing for keys! One more convenient loading feature: a hydraulic lift-gate (which slowly drops down in pickups and opens up in hatchbacks) and can be moved with only a finger. 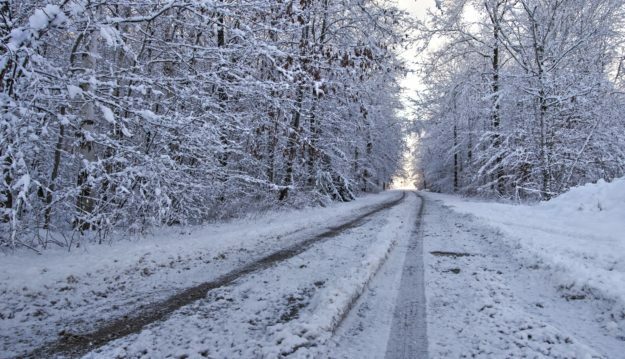 The drive to your winter escape could be a long haul. And, you’re likely going to have someone with you: friend, spouse, kids. Traveling hundreds of miles while trying to agree on a comfortable interior temperature can be challenging. Dual-zone automatic climate control is the ultimate peacemaker; giving the driver and front passenger the ability to fine-tune the temperature. Simply set it, and the system makes adjustments to keep everyone comfortable. While in “auto” mode, it keeps everything steady, so you’re decreasing adjustments and increasing safety. Having to pull over during your trip to repeatedly knock icy messes off your wiper blades is inconvenient and a safety hazard. As their name states, winter wiper blades are built specifically for winter driving, preventing ice from building up on the blade holder. Now, ice and wet snow get lifted off the blade so it rides flat against the windshield. Some of these special wipers do have a tendency to lift up at high speeds, which may not be an issue when driving in winter conditions. You just need to replace them after winter with summer-friendly blades because they may streak in rainy conditions. Since we’re discussing being able to see clearly, think about automatic high beams. This feature automatically turns off your high beams for oncoming traffic, and then brings them back up after the car passes. This makes nighttime driving on back roads easier, which can be stressful due to winter driving conditions. OK, ground clearance isn’t a feature that can be easily changed, but it’s something to consider when shopping for your winter-friendly vehicle. For most SUVs, the distance between the chassis and the driving surface is 8 inches, enough room to handle most snowfalls. With more ground clearance, you have added ability to dance over boulders, cross streams, and climb up steep pitches of dirt road. However, with less ground clearance, let’s say 6.5 inches (still more than most cars and many minivans have), you need to carefully consider what you’ll be driving over. So, depending on your off-road needs, take the time to take some measurements. Finding the right car, truck, or SUV for your winter outdoor adventures isn’t easy. In the end, it has to work for you, so do your research on vehicle makes, models, and features. We suggest discussing your winter trip needs with a reputable, ethical, and honest used car dealer. Bring your needs—whether that’s off-road handling or special vehicle features—to a 199ride.com dealership: Green Bay Auto, Appleton Auto, Wausau Auto, Antigo Auto, and 199ride La Crosse.